Vancouver, BC based Far Resources (CSE:FAT) (FSE:F0R) announced earlier today the results of the Phase 2 drill program that confirmed extensive lithium mineralization in the Dyke 1 pegmatite on the Zoro Lithium Property in Manitoba. - FAR17-010 intersected spodumene-bearing pegmatite over 53.7m and had significant Li2O results of 1.2% Li2O over 38.3m including 2.3% Li2O over 4.6m, 2.6% Li2O over 2.1m and 1.4% Li2O over 7.7m. - FAR17-012 intersected coarse spodumene crystals up to 15cm in length over 12.2m and had significant Li2O results of 1.7%, Li2O over 10.7m including 4.1% Li2O over 0.4m and 2.1% Li2O over 5.1m. Pegmatite intersections reflect the historical results as well as those predicted by the three-dimensional model. The Phase 2 drilling program has given further confidence as to the dimensions and geometry of Dyke 1 and the three-dimensional geological model is being updated to include the new drillholes. Keith Anderson, President and CEO, commented, "We are extremely pleased that the results of the Phase 2 drill program established continuity of mineralization in the Dyke 1 Pegmatite at depth. The most significant drillhole intersected 1.2% Li2O over 38.3m (FAR17-010) confirming that Dyke 1 thickens at depth and continues to host high grade lithium. Further exploration will be focused on expanding the mineralization both along strike and at depth of this impressive intersection." 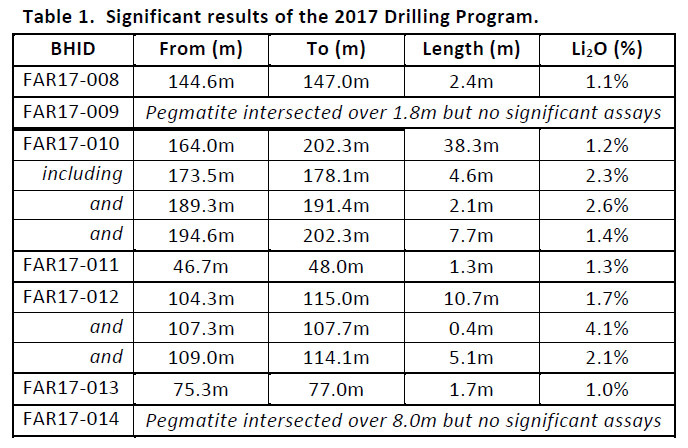 The objective of the Phase 2 drill program, which was completed on April 15th, 2017, was to test the Dyke 1 pegmatite within 150m from surface and along strike. The program was designed to step out from the results of the Phase 1 drill program which tested significant historic 1956 drilling and related assays. The program consisted of 7 drillholes totaling 1,088 metres and a list of summarized results is tabled below. With the success of drilling on the Dyke 1 Pegmatite, the Company is planning a field assessment in June to study the other high-grade lithium-bearing pegmatites in trenches blasted at Dykes 2 through 7, located on optioned ground to the northeast of the Zoro Lithium Property. This work will involve exploration for additional pegmatite dykes reported in outcrop but not assessed by trenching. Dyke 1 be further evaluated for mineralogy and zonation, and surrounding host rock will be sampled to determine if background lithium values are higher near the pegmatite contact. These results will then be used to explore for pegmatites that may not outcrop at surface. Geological information gathered during this project will be used to plan a Phase 3 drilling program. The technical content of this news release has been reviewed and approved by Mark Fedikow P.Geo., a qualified person as defined under NI 43-101. Pulp duplicates, core duplicates and blanks were inserted into the sample stream at regular intervals. A total of 167 core samples were shipped to Activation Laboratories in Ancaster, Ontario, an ISO certified laboratory, for analysis of lithium and other elements. All QAQC samples passed QAQC protocols. Far Resources Ltd. is an exploration company, publicly traded on the Canadian Securities Exchange under the symbol FAT, focused on the identification and development of high potential mineral opportunities in stable jurisdictions. Please visit our website at www.farresources.com for full details. Far Resources may acquire or option properties of merit to meet its ongoing goal to locate, advance and unlock the potential of these mineral opportunities. Far Resources has option agreements in place on the Zoro Lithium Property in Manitoba, Canada and the Winston Property in New Mexico, USA. Far Resources has optioned its wholly owned Tchentlo Lake Property in British Columbia, Canada to Alchemist Mining Inc. This news release contains forward-looking statements, which relate to future events or future performance and reflect management's current expectations and assumptions. Such forward-looking statements reflect management's current beliefs and are based on assumptions made by and information currently available to the Company. Readers are cautioned that these forward looking statements are neither promises nor guarantees, and are subject to risks and uncertainties that may cause future results to differ materially from those expected including but not limited to capital and operating costs varying significantly from estimates, delays in obtaining or failures to obtain required governmental, environmental or other project approvals, uncertainties relating to the availability and costs of financing needed in the future, changes in equity markets, inflation, delays in the development of projects and the other risks involved in the mineral exploration and development industry. Specifically, mining and exploration is subject to numerous risks factors as set out in the Company's public documents filed on SEDAR. All of the forward-looking statements made in this news release are qualified by these cautionary statements and those in our continuous disclosure filings available on SEDAR at www.sedar.com. These forward-looking statements are made as of the date hereof and the Company does not assume any obligation to update or revise them to reflect new events or circumstances save as required under applicable securities legislation. This news release does not constitute an offer to sell securities and the Company is not soliciting an offer to buy securities in any jurisdiction in which such offer, solicitation or sale would be unlawful prior to registration or qualification under the securities laws of such jurisdiction. This news release does not constitute an offer of securities for sale in the United States. These securities have not and will not be registered under United States Securities Act of 1933, as amended, or any state securities laws and may not be offered or sold in the United States or to a U.S. Person unless so registered, or an exemption from registration is relied upon. Legal Disclaimer/Disclosure: This document is not and should not be construed as an offer to sell or the solicitation of an offer to purchase or subscribe for any investment. No information in this Report should be construed as individualized investment advice. A licensed financial advisor should be consulted prior to making any investment decision. We make no guarantee, representation or warranty and accept no responsibility or liability as to its accuracy or completeness. Baystreet.ca assumes no warranty, liability or guarantee for the current relevance, correctness or completeness of any information provided within this Report and will not be held liable for the consequence of reliance upon any opinion or statement contained herein or any omission. Baystreet.ca has been compensated four thousand dollars for its efforts in presenting the FAT profile on its web site and distributing it to its database of subscribers as well as other services. Furthermore, we assume no liability for any direct or indirect loss or damage or, in particular, for lost profit, which you may incur as a result of the use and existence of the information, provided within this Report.